More than 25 years of highly visible and diverse communications and public relations experience in a variety of sectors including energy and power, engineering, construction, transportation, manufacturing, chemicals and non-profit/trade associations. Proven ability to build and manage strategic corporate communications and PR functions; counsel senior executives and earn their trust; develop strategies and tactics that support business objectives and lead to measurable success; determine and meet the needs of internal and external audiences; successfully position products/services to win new/continued business; and motivate employees to exceed expectations. International communications and marketing experience. “Washington” experience. Master’s degree in business with a concentration in marketing. Launched a full-service public relations/corporate communications firm to help organizations and individuals that would benefit from having access to a senior communicator but cannot afford the high salary or might not have enough work to justify a full-time hire. 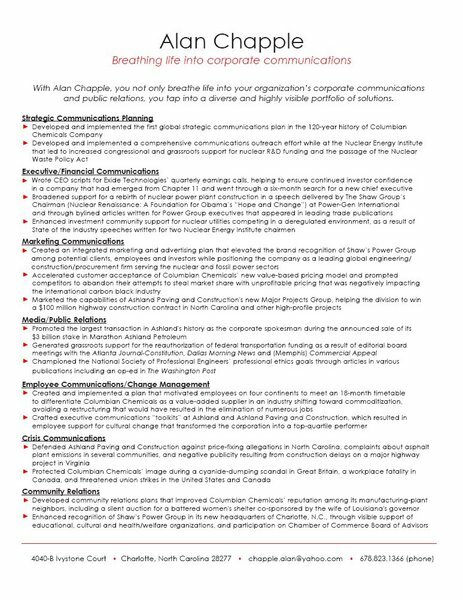 Chapple Public Relations offers a value proposition unusual among PR firms: charging by the project, not by the hour. As a result, clients needn’t fear that the meter is running each time they call for communications counsel. In addition, CPR does not require a retainer, so clients need not worry about getting their money's worth each month. Responsible for developing external communications strategies to elevate the visibility of this Fortune 1000 energy company and its executives as industry leaders, as well as positioning natural gas as the fuel of choice to reduce greenhouse gas emissions and enhance the nation’s energy security. -- Worked with key executives and outside communications counsel to craft a public relations and community relations program that neutralized efforts by opposition groups to derail the company’s planned expansion of a natural gas storage facility in Louisiana. -- Led media relations and on-the-ground crisis communications activities following the disappearance and death of a business-unit-president and a gas-related explosion that destroyed and damaged 19 homes.-- Developed an in-house media training course to prepare operations managers for the role of spokesperson during routine events as well as crises.-- Positioned company executives as subject-matter experts by writing and placing bylined articles in widely read trade publications and by securing speaking opportunities. -- Responsible for writing the company’s 2009 Annual Report and the Corporate Responsibility Report. Serve as an online professor teaching an accelerated Introduction to Communications (COM100) bachelor's degree course offered by the University of Phoenix. 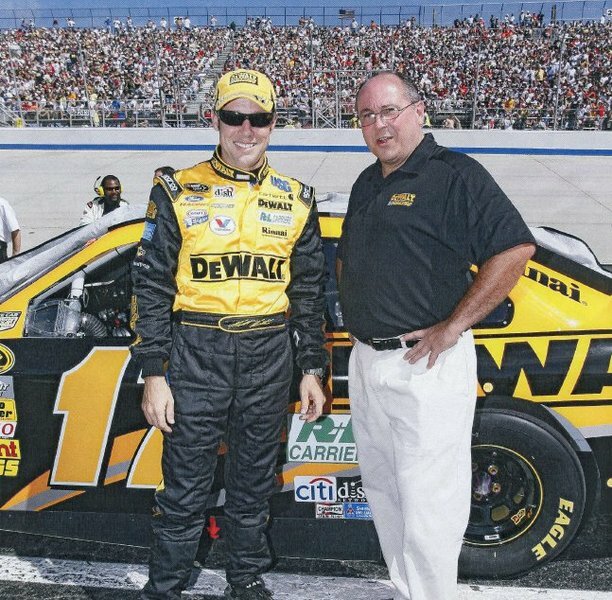 Responsible for strategic marketing and communications for the number-one ranked company in the Power sector on Engineering News-Record’s list of Top 500 Design Firms – a $3.7 billion division of The Shaw Group. -- Established Shaw’s Power Group as a leading company in its new headquarters city of Charlotte by developing strong relationships with local reporters, high schools and colleges, and community organizations, as well as being named to the Charlotte Chamber of Commerce Board of Advisors.-- Gained industry-wide recognition for company executives by writing keynote speech for Power-Gen International 2008 for The Shaw Group’s chairman and bylined articles for other executives in key trade publications.-- Supported business development activities that led to multi-billion-dollar contracts for new nuclear power plants.-- Worked with Power Group clients, community leaders and citizens in seven states to gain local support for coal-fired and nuclear power plant construction projects. Director, Communications, 2004-2006 Created a corporate communications function that helped to restore confidence in Exide among employees, customers, suppliers and the investment community following this $2.7 billion global manufacturing firm’s emergence from Chapter 11 bankruptcy protection. 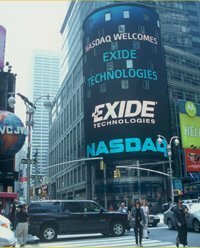 -- Provided a new CEO with a communications plan that allayed fears that Exide was adrift so soon after exiting Chapter 11 bankruptcy.-- Generated widespread acceptance that the company’s Take Charge! initiative is a long-term commitment to reduce costs by $20 million rather than a “flavor of the month” program.-- Enabled the leadership team to fulfill its pledge to make the “new” Exide more open and transparent for internal and external stakeholders.-- Restored the company’s integrity and regained the trust of stakeholders, which were jeopardized by a highly publicized scandal during the 1990s. 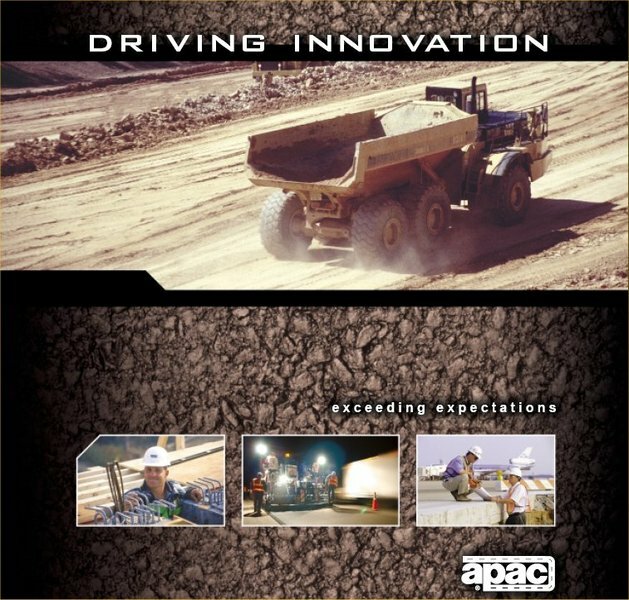 Developed strategic communications that positioned Ashland Paving and Construction as the nation’s leading transportation construction firm, enabling this $2.5 billion division of Ashland to shed its image as a group of locally managed businesses and leverage the advantages it possesses as a unified organization. 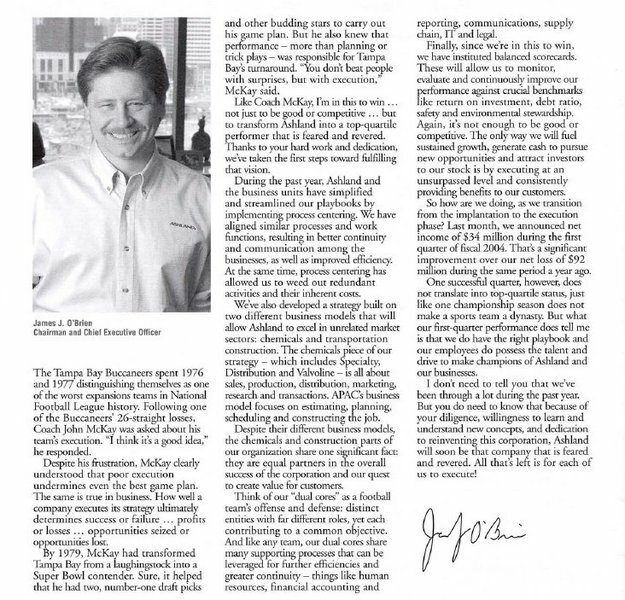 -- Participated in business development activities that led to the division winning a $100 million highway construction contract in North Carolina and other high-profile projects.-- Successfully defended the division against price-fixing allegations in North Carolina, complaints about asphalt plant emissions in several communities, and negative publicity resulting from construction delays on a major highway project in Virginia.-- Promoted the largest transaction in Ashland’s history as the corporate spokesman during the announced sale of its stake in Marathon Ashland Petroleum.-- Generated grassroots and media support for the reauthorization of federal transportation funding. 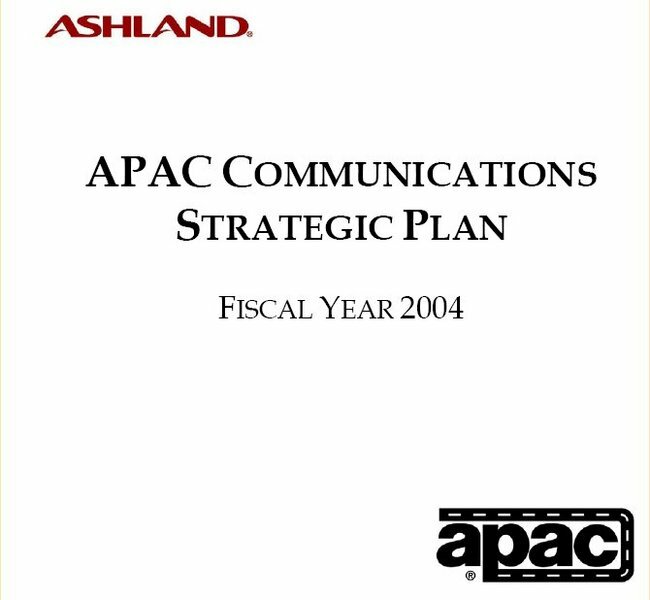 Created and implemented the first global strategic communications plan in the 120-year history of the $600 million specialty chemicals business unit of Phelps Dodge Corporation. 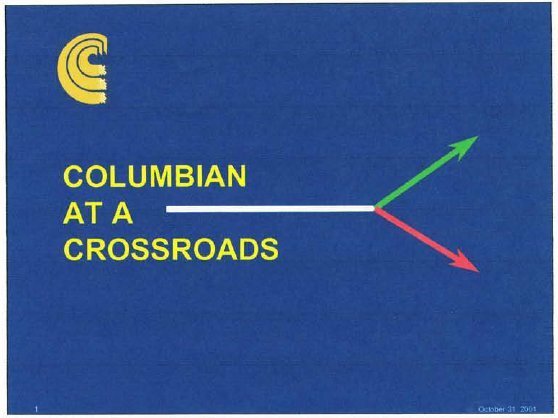 -- Produced and implemented a plan that helped employees meet an 18-month timetable to differentiate Columbian as a value-added supplier in an industry shifting toward commoditization, avoiding a restructuring that would have resulted in the elimination of numerous jobs. -- Accelerated customer acceptance of the company’s new value-based pricing model and prompted competitors to abandon their attempts to steal market share with unprofitable pricing that was negatively impacting the entire industry.-- Developed community relations plans to improve Columbian’s reputation among its neighbors, including a silent auction for a battered women’s shelter co-sponsored by the wife of Louisiana’s governor.-- Successfully protected Columbian’s image during a cyanide-dumping scandal in Great Britain. 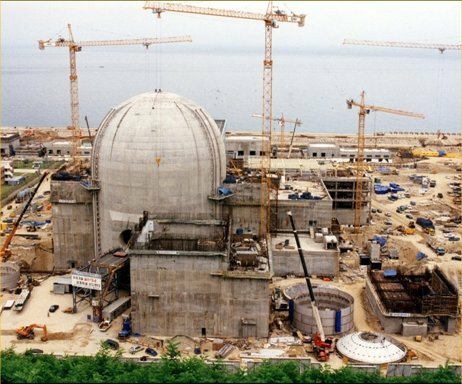 Created strategic communications to influence and educate key audiences regarding the benefits of the nuclear energy industry, resulting in an upswing in public and legislative support. Managed four employees.-- Enhanced investment community support for nuclear utilities competing in a deregulated environment, as a result of State of the Industry speeches written for two NEI chairmen.-- Improved public perception of nuclear energy and increased support among key lawmakers for passage of the Nuclear Waste Policy Act and increased federal funding of nuclear-related initiatives.-- Enabled NEI to create a new niche in the area of nuclear plant decommissioning to serve its member utilities and nuclear plant neighbors. Nuclear Renaissance: Foundation for Obama's "Hope and Change"